It’s autumn, the leaves are turning and it’s that time of year when classical music’s own type of seasons start up again to keep everyone going through until the Spring. A major difference this year is that the orchestras are returning to their favourite east coast symphony hall. The Usher Hall opened its doors for the 2009 Edinburgh International Festival and even though refurbishment work isn’t quite complete, the doors are staying open for the Royal Scottish National Orchestra, who are first in there on 2 October, the Scottish Chamber Orchestra, who are hot on their heels on 8 October, and the BBC Scottish Symphony Orchestra, who are hoping that the transformed hall will transform their Edinburgh audience figures into healthier ones than those of the past. 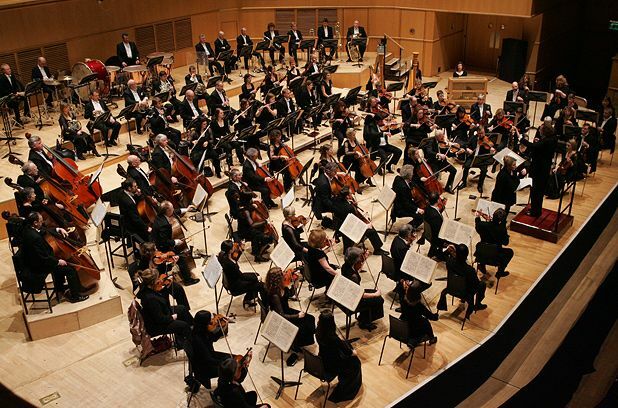 All three orchestras are fielding high flyer maestros in some stunning programming to draw the crowds to their Edinburgh dates. Stéphane Denève, RSNO Music Director, introduces his orchestra’s season in one of the most colourful concerts. Rimsky-Korsakov’s Scheherazade, and its exotic tales of Arabian nights, sits alongside Knussen’s Flourish with Fireworks. The SCO’s trump cards for their opening concert are conductor Louis Langrée and soprano Lisa Milne in pieces of music which were famously left unfinished – Schubert’s Symphony No 8 and Mozart’s C minor Mass. New Chief Conductor of the BBC SSO is Edinburgh-born Donald Runnicles who turns to two of the greatest symphonies ever written – Mahler’s Symphony No 1 – Titan and Beethoven’s Symphony No 1. All programmes can, of course, be heard in Glasgow too. Chamber and early music lovers are not missed out of the season openings. Milngavie Music Club is one of many such clubs up and down the country that puts on consistently good chamber music events. Their opening event is the Wihan String Quartet from Czech Republic, who play music of their homeland in the form of Janácek, Smetana and Dvorák. Earlier quartets can be heard in the Georgian Concert Society’s first concert, when the Fitzwilliam Quartet turn their attention to the great master of string quartets, Haydn. The Fitzwilliam String Quartet consists of Lucy Russell (violin), Marcus Barcham Stevens (violin), Alan George (viola) and Sally Pendlebury (cello) and has been going since 1968. Stéphane Denève opens the 2009/10 season with an orchestral tour de force in a colourfully pictorial programme, featuring Oliver Knussen's 'Flourish with Fireworks' and 'The Way to Castle Yonder', and Rimsky-Korsakov's exotic 'Scheherazade'. Leading pianist Lars Vogt also performs Mozart's 'Piano Concerto No 24'. Pianist Terrence Wilson joins the RSNO for the European premiere of Michael Daugherty's piano concerto, 'Deus ex machina', inspired by speeding trains and mechanical rhythms. On either side are two popular favourites: Grieg's 'Peer Gynt Suite No 1' and, for the finale, Tchaikovsky's singularly gorgeous 'Symphony No 5'. Beethoven's instantly recognisable, groundbreaking symphony provides a big finale to this concert, which opens with Borodin's symphonic poem 'In the Steppes of Central Asia' and features Henning Kraggerud as soloist in Sibelius' formidable 'Violin Concerto'. Joseph Swensen conducts. Donald Runnicles conducts the BBC Scottish Symphony Orchestra in a programme of works including Mahler's 'Symphony No 4', Britten's 'Violin Concerto' and Webern 'Im Sommerwind'. Milngavie Music Club's 2009/10 concert series kicks off with the acclaimed Czech ensemble on one of its regular visits to the UK, bringing with it quartets by fellow Czech composers Dvorák, Smetana and Janácek.